This contest has finished. Congratulations to the winning designer @ichis! 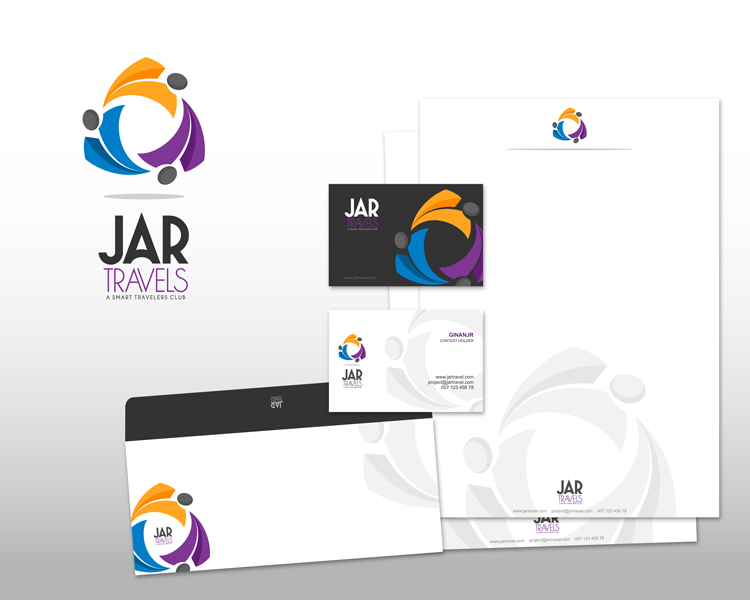 I need a logo for our company JARTravels. It will be put on website, power point presentation, brochures, stationaries, etc. The logo should be simple, and the word 'Travels' is changeable with other word that represent different sub-company or division, such as JARHotels, JARTours, etc. or "your lifestyle travelers club"
JAR Travels is a "travel club", a community of Indonesian travelers who travel both domestic and overseas. The community can share members experiences as well as news updates. JAR Travels sells to members only all kind of low cost - wholesale price - travel products and services such as ground tours, airlines tickets, hotels, etc. Meanwhile JAR company itself is the holding company, while Travels is a business unit of JAR company. The other JAR business unit might be JAR Tours or other name. JAR stands for my last 3 digit of my family name and also my kid's first alphabet of their names. So, J, A, R should be in the same size, same tunes, same font. A two or three color combinations such as grey with deep ocean green, orange and dark blue, or other, that represents happiness, fun, togetherness, recreational, sky. I also open for your coloring proposal. The logo is for website, printable, use in T-Shirt, and the colors are for the interior design of store/kiosk.